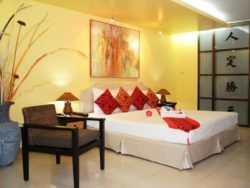 Pattaya has a good variety of budget guest friendly hotels that let you spend time with your friends and partners without having to worry too much about the cost. Most of these hotels are under 1,000 baht per night, although prices can vary depending on the season. Since these are budget hotels, you shouldn’t expect the ultimate in luxury. However, most offer a comfortable bed to sleep on, a decent amount of space, air conditioning, Wi-Fi and all the comforts you need for a good night’s sleep. 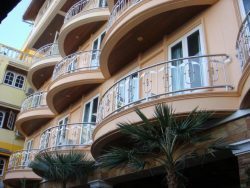 We’ve listed our recommended budget guest friendly hotels in Pattaya below, with links to check the current rates on Agoda.com, user ratings and quick reviews. 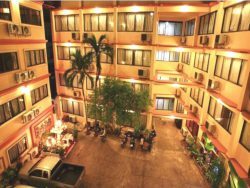 Walking Street Guest House is the cheapest hotel in Pattaya that we’re comfortable to recommend. The rooms here are clean and have large, comfortable beds. There’s also a small desk for working on or for when your friends needs to do their makeup, a reasonably large bedroom mirror, flatscreen TV and some artwork. 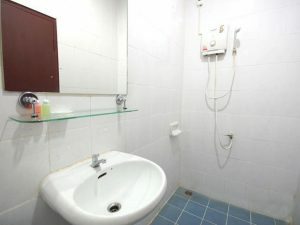 The bathrooms are small but offer the usual sink, mirror and Thai-style hot water shower. Walking Street Guest House is rated 8.1 out of 10 by Agoda users, which is an impressive score for an ultra-budget guesthouse. It’s located right in the heart of Walking Street, meaning you’ll be close to all of Pattaya’s most popular go-go bars and other nightlife. Expect a little bit of noise at night, although nothing too bad. This hotel is 100% guest friendly. The staff are used to customers bringing back new friends and will never bother you. 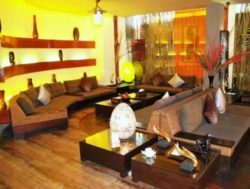 There are also no fees for joiners, meaning you can stay here and enjoy a cheap but comfortable time in Pattaya. Expect to pay 500-800 baht per night, depending on the time of year you visit and the room size you choose. 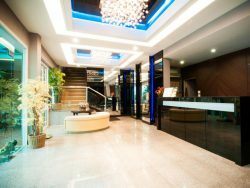 If you want a hotel that’s more upmarket than Walking Street Guesthouse but don’t want to pay a fortune, Dream Hotel Pattaya is a good low-cost upgrade. Rooms here are larger than at Walking Street Guesthouse, have slightly nicer furniture and get a lot more natural light. The hotel is also in a much quieter location, about a block from Walking Street. This means you can walk to Walking Street in just a couple of minutes but have a fairly low overall noise level. Dream Hotel Pattaya is rated 7.1 out of 10 by Agoda users. There’s free Wi-Fi at Dream Hotel, mini-fridges in all of the rooms, TVs and all of the usual features you’d expect from a Thai budget hotel. The beds are soft and comfortable, thankfully with none of the backbreakingly hard mattresses that are common in Thailand. The staff are used to guests bringing partners back and won’t bother you at all. There are also no joiner fees. Rates here are usually 800 to 1,000 baht per night but can vary depending on the season and type of room you choose. P.72 is located near the heart of Walking Street, making it a good choice if you want to visit any of the go-go bars and nightclubs in the area. 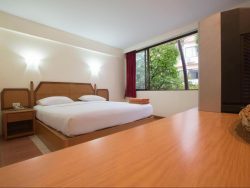 This hotel is definitely a step above Walking Street Guesthouse in terms of quality and has reasonably large, very clean rooms with large windows and small balconies. P.72 Hotel is rated 7.4 out of 10 by Agoda users. The beds here are queen sized and very comfortable, with soft mattresses and high quality sheets that feel like they’re from a much more expensive hotel. 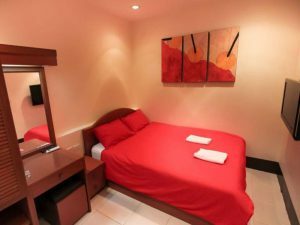 The rooms feel modern and have nicely decorated bathrooms with pleasant features like decorative tiling around the shower and big sinks and vanity units. Overall, this place is priced like a two star hotel but feels like a three and a half star hotel. Of course, there’s free, fast Wi-Fi in rooms and all areas. Expect to pay 800 to 1,000 baht per night, depending on the season and the type of room you book. Another good budget option, The Green View is a comfortable two star hotel with spacious rooms and big beds. 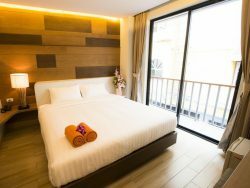 The rooms here are a step above most of the cheap hotels around Pattaya, making this a good option if you want a reasonable level of comfort without spending too much. The Wi-Fi is fast, the hotel is an easy walk away from Beach Road and Walking Street, and overall it’s a good deal. 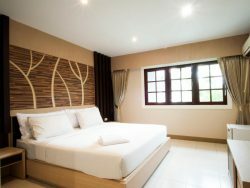 Expect to pay 900 to 1,200 baht per night, depending on the season and the type of room you book. All in all, Pasadena Lodge Hotel is a step above most of the other budget hotels around this area. It’s also totally guest friendly, with easygoing staff and no fees to bring guests back to your room. Expect to pay 800 to 1,300 baht per night, depending on the season and the type of room you book.